If you are thinking about starting a blog, do it! Blogging is an amazing way to meet new people, share your stories, and make your mark on the world. The ‘blogosphere’ is full of awesome, passionate people, and your life will be improved by getting to know them. Of course, if you start a blog you’ll want to do it right. 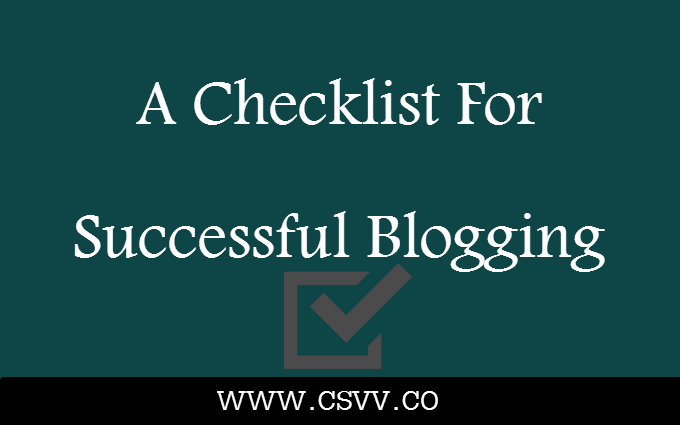 Here is a checklist that you can follow to make sure your blog is a real success. The purpose of having a blog is to share the things you are passionate about with others, and to engage with people who have similar interests and purposes. In order to do this, you have to do more than simply write and publish blog posts. You must also respond to the comments, questions, and even criticisms that you receive. By doing this, you make it much more likely that people will follow your blog and share what you write with others. Know what your audience cares and is concerned about. Learn what current issues in your niche are going to have the biggest impact on your followers and post about those things. Yes, your blog is about your passions as well, and you shouldn’t go completely away from your blog’s focal point. However, if you want your audience to stick with you, it is important to keep them interested by making sure that your content is relevant to them. In addition to this, you can remain relevant by being yourself and infusing your posts with your personality and opinions. Most people aren’t that willing to subscribe to a blog that has no passion behind it. Before publishing a blog post, make sure that you have done everything you can to post something that is truthful, fair, and factually accurate. Then, if you find out later that you did write something in error, apologize, retract, and fix the mistake. As a rule, people seek out authority and trustworthiness in the people that they follow, caring about accuracy is very important. In addition to that, Google’s search quality guidelines have defined certain topics such as health and well-being, finance, and parenting as being important enough that blogs and websites addressing these issues should be held to higher standards of accuracy. This means that sloppy research and posting without verifying could get you into hot water. It’s important, especially when you start blogging to continue posting on a regular basis. This can be difficult to do when you have little or no following. However, the only way that you can get an audience, is to post consistently and reliably, and to keep promoting your posts on your social media pages. Sure, some bloggers seem to build a large audience almost instantaneously, however, most people build their following just a few audience members at a time. Even though finding motivation isn’t always easy, you should always be on the lookout for ways to improve your blog. This might mean working on becoming a better writer. You could also learn to use a variety of tools that can help you to make your blog more interesting and your posts more shareable. For example, you could learn to create infographics or to create quizzes and polls for your followers. Most of all, whatever your niche is, you should work to find ways to expand your knowledge and capabilities so that you have more to offer your readers. Chances are, you aren’t the only person blogging about your topic. That’s okay. You can still stand out in the crowd by adding your own unique spin, and by finding what your target audience wants that it isn’t getting anywhere else. Then, use your blog to fill in that space. Your uniqueness is one of the things that will help you to build up an audience. While there is some competition among bloggers, for the most part the blogging community is very supportive. As you are developing your own blog, check out other blogs in your niche and in related niches. Begin following them and forming relationships with them. Other bloggers are almost always happy to share information and advice with you about blogging, and about any shared interests. You can also use a tool like BuzzSumo that will help you to find the posts that other bloggers are writing that are getting the most social shares. This is a great way to get ideas for content. When a blog post you have written shows up in a person’s search engine results, there is a very good chance that the reason they were doing the search in the first place was that they had a problem that needed solving or a desire to obtain some information that they could apply in a practical way. It’s fine to have some posts that are all about your brand, or that promotes products and services that you might be selling (directly or as an affiliate), but those posts should be much less frequent than posts that are there to inform, educate, or entertain your followers.